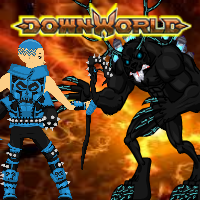 ﻿You can now battle your friends in downWorld. Simply go to The Arena and may the best warrior win! Remember to get better armor and weapons, which will help you beat monsters, and other players! Help Jack o' Lantern through the night by blasting zombies with your pumpkin cannon! A friend needs your help. He has lost all his bones and only you can gather them for him. Gather them up as fast as you can but watch out for the bulldogs that do not want to give them up. Spot the differences in this traditional fairy tale about Snow White. It is up to you to choose the right colors for this brave African warrior! Then you can save the picture and send it with your exotic greetings to your friends! Or click on the Singhalese mask for another mask to color.